Panthers co-promoters Trevor Swales (left) and Ged Rathbone. Promoter Ged Rathbone has described the prospect of Panthers racing on in 2016 as ‘massively realistic’. The Middlesbrough-based businessman has overseen a terrific 2015 campaign in which the city club overcame a catalogue of injury problems to reach the semi-finals of the Premier League play-offs. Their dreams of title glory were eventually dashed when they crashed to a 58-32 loss at reigning champions Edinburgh last Friday night in the second leg of their last-four showdown. That sealed a 102-78 exit on aggregate. 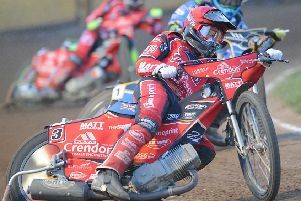 Rathbone believes his decision to step in last winter and ensure the sport continued in the city has been vindicated not only by performances on the track, but also increased attendances culminating in a pair of bumper turnouts for recent play-off clashes. He and fellow promoter Trevor Swales will represent the club at the annual British Speedway Promoters’ Association (BSPA) annual meeting this week - after which the landscape for the future is likely to become clearer. Speaking at a well-attended fans’ forum on Tuesday night, Rathbone said: “The first thing I have to do is thank everyone who has turned out regularly throughout the season. “We could not have made this work without getting some great support and a lot of people have played a part in 2015 being a success. “It has been very hard work and has almost become a seven-day-a-week job to promote the club, but we have met our main objective of having a good season on the track and ensuring that all our bills have been paid in full and on time. “We have already spoken as a management team about our plans for the future and I would say it is massively realistic to think we will be back on track next year. “First and foremost we need to see what happens at the BSPA meeting this weekend and then there are other meetings we need to have with our landlords at the Showground and the owners, Rick Frost and Julie Mahoney, who have also been our major sponsors. Rathbone instantly dismissed the idea of again asking fans for financial pledges - something which received a fine response last winter when the club was battling to make it to the tapes. He added: “No way am I getting the begging bowls out again. “It was something we had to do last winter, but it is not something we will consider again. “The club needs to be able to stand on its own two feet and that is what we are working towards.